Paul Kurtz (Vanderbilt, 1968) has always been a humble individual who has found the simple things important. In a recent interview, he cited his family, his love of education and his devotion to Alpha Epsilon Pi as things which have been central in his life. Born in New York City, Brother Kurtz was raised with his two sisters in Spring Valley, N.Y. His mother was a stay-at-home parent until he and his sisters entered school, while his father worked in middle management at a toy manufacturer. One of the important lessons he learned from his father, who long worked in an unsatisfying job situation, was to find a career that brought him joy. Throughout high school, Brother Kurtz had a special talent for sports writing. He worked for a small local newspaper, covering youth and high school sports. His interest in applying to Vanderbilt was generated by his sports editor’s suggestion that he apply for the Grantland Rice scholarship which is awarded by Rice’s alma mater in Nashville, Tenn. He credits his mother – one of the biggest influences in his life – in helping to encourage him to go away to school, where he would meet people from a different part of the country and learn about them and about the south. Brother Kurtz took a leap of faith and enrolled at Vanderbilt in the fall of 1964, with the goal of obtaining a degree in political science. In his time at the university, he would find his home-away-from-home at the AEPi fraternity house. To this day, he firmly believes that had it not been for the AEPi Tau Chapter, he might well have dropped out of school. Brother Kurtz graduated in 1968 at the height of the Vietnam war. He intended to go to law school but deferred his enrollment at the University of Virginia when ordered by his draft board to take a physical exam for draft purposes. He was declared physically unable to serve and then lived with his parents for a year while working on the local newspaper. In deciding where to attend law school after the year’s interruption in his education, he concluded he would prefer to attend Vanderbilt allowing him to be closer to his girlfriend. They married after his second year. One of the biggest challenges for him was deciding what to do with his law degree. He knew he didn’t want to become a lawyer and set his eyes on teaching instead. In preparation for that career, he worked as a judicial clerk in Nashville for a judge of the United States Sixth Circuit Court of Appeals. After earning his master’s degree at Harvard Law School and teaching legal research and writing at Boston College for a year, he took a job at the University of Georgia Law School. What he originally thought would be a few years of his time eventually became a lifetime career in Athens, Ga. for him, his wife and their son. Brother Kurtz enjoyed teaching criminal law, family law and constitutional law for 38 years. 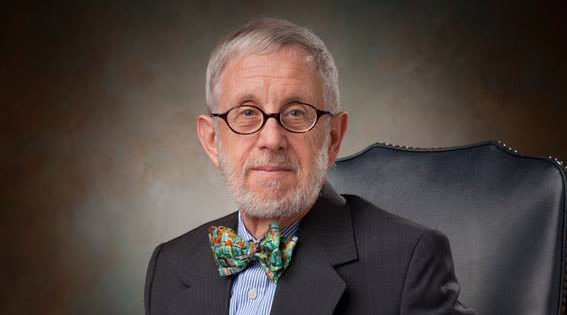 He also served as Associate Dean of the law school from 1991 until his retirement in 2013. While he found his primary satisfaction in his teaching, he also is the co-author of “Family Law: Cases, Text, Problems,” which became one of the nation’s leading family law case books and is currently in its sixth edition. He served as chapter advisor for the Omicron chapter at the University of Georgia for almost twenty years. The main reason he volunteered was so that he could “pay-it-forward” for all that AEPi had done for him. He also wanted to honor Abe Corenswet, one of the Tau chapter founders and the advisor for the chapter while Brother Kurtz was an undergraduate. After retiring, Kurtz was selected as a recipient of the President’s Medal from the University of Georgia, which he received in a ceremony on January 23, 2017. This award recognizes extraordinary contributions of individuals who are not currently employees of UGA and who have supported students and academic programs, advanced research and inspired community leaders to enhance the quality of life of citizens in Georgia. He was flattered and touched that the president of the university, who was one of his students early in his career, had chosen him. It was something quite special to him. Today, he enjoys his retirement with his wife traveling the world. He works for the Jewish Federation in Athens and continues to be active in his local temple. He is an associate member of Hadassah and a member of the committee leading the campaign for the Tau chapter house in Nashville.